Billed as "Ultimate Tour Named Death", the run will begin in Bakersfield, CA on September 13; Nothing More will provide support for the trek, which will see additional dates added moving forward. Presales begin Tuesday, April 2 at 10 AM local time, with general public tickets going on sale Friday, April 5 at 10 AM local time. Ghost recorded “Prequelle” with producer Tom Dalgety (Royal Blood, Opeth) at Artery Studios in Stockholm, Sweden. Launched with the lead single, “Rats”, the project debuted at No. 3 on the Billboard 200 to deliver the group their highest-charting US album to date. 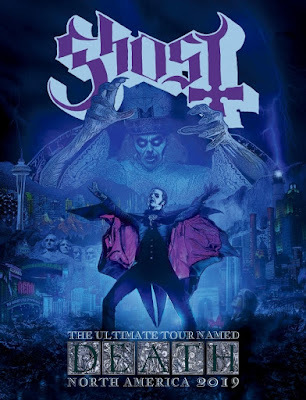 Last month, Ghost performed at Download Festivals in Australia and Japan, and will resume their 2019 live schedule when they join Metallica on their summer European stadium run when it begins in Portugal in early May.